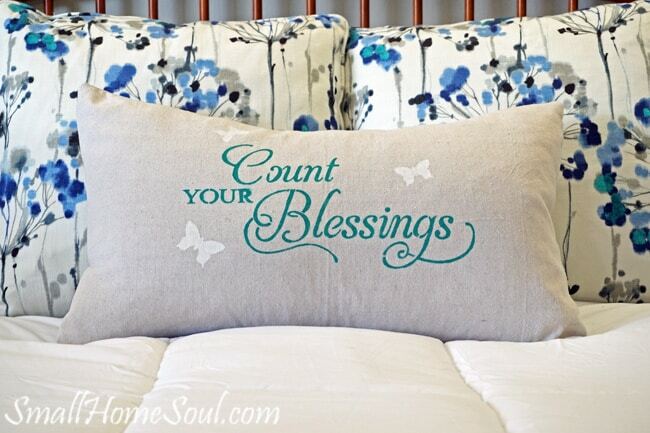 Stenciled Drop Cloth Pillow Cover - Girl, Just DIY! 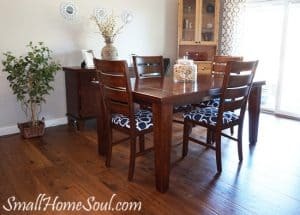 Are you ready for a fun project using a drop cloth? 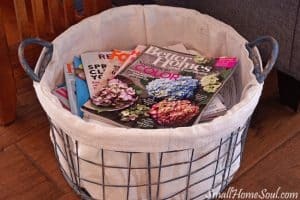 Did you know you could use drop cloths for things other than painting? 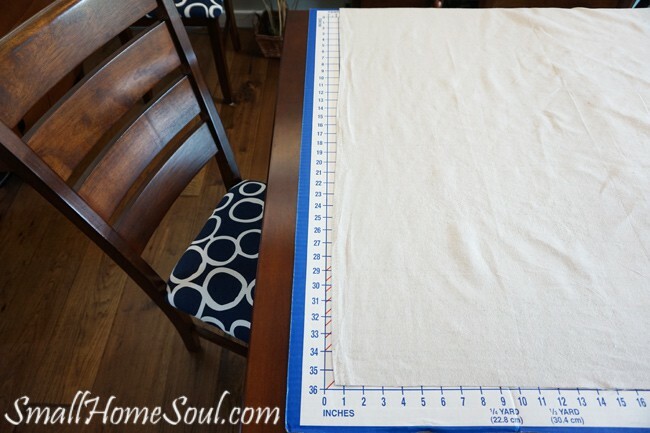 Until about a year ago I didn’t realize people would use a drop cloth in place of fabric for all kinds of things. After seeing all the cool projects it makes perfect sense; I mean, where are you going to get 3 yards of canvas for around $10. 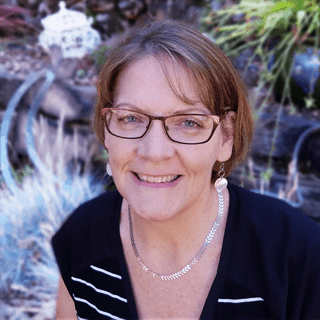 I belong to a blogging group (my tribe) on Facebook and I’ve learned so much in the past 3 months from them. They are fun and encouraging and above all else helpful. We are starting a monthly challenge where someone proposes a project challenge of some sort and the rest of us get in on the fun. When everyone’s done we have a link up so each of our projects show in each others blogs. One person hosts it and everyone else links up their project post to the hostt. 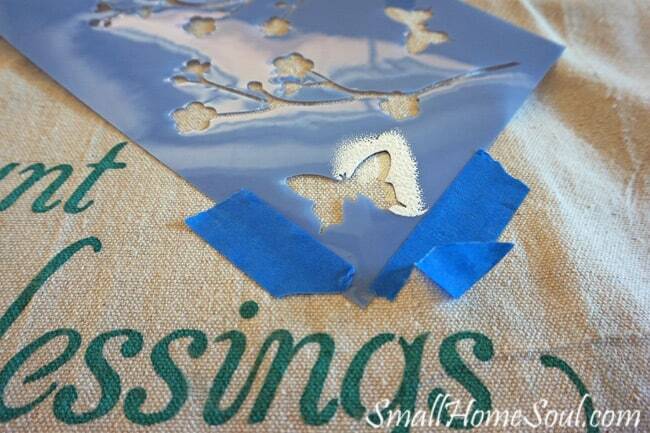 Anyway, this month’s challenge is, you guessed it, ….to use a drop cloth in a creative way. I’m sure you’ll be seeing some very creative projects because we have lots of talent in my group. 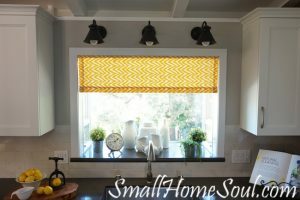 I started out with the plan to make curtains for the arbor on my patio but I hit some major snags and had to switch gears. I’ll get them done eventually and will share them sometime before summer. 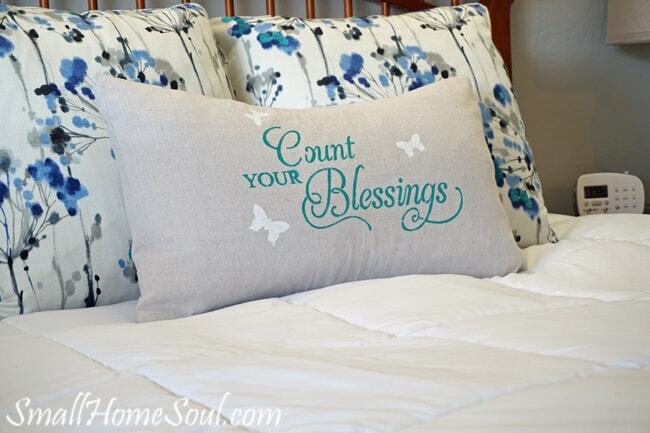 Until then, I’m showing you how to make a beautiful stenciled drop cloth pillow cover. 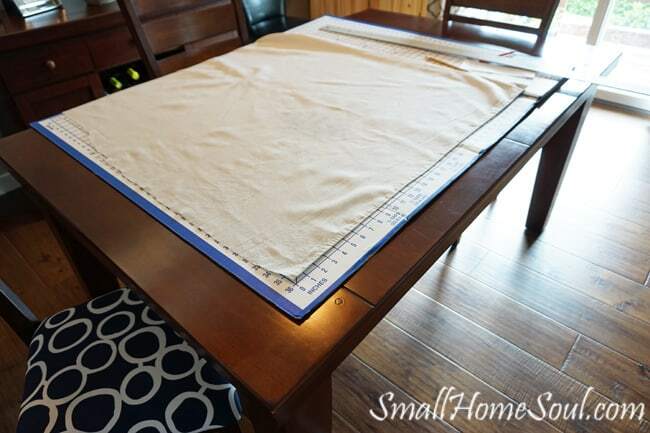 The pillow insert I bought from IKEA was 16″ x 26″ and since I wanted the pillow to be full I cut the fabric for my front piece at 26″ wide and 16″ inches tall. 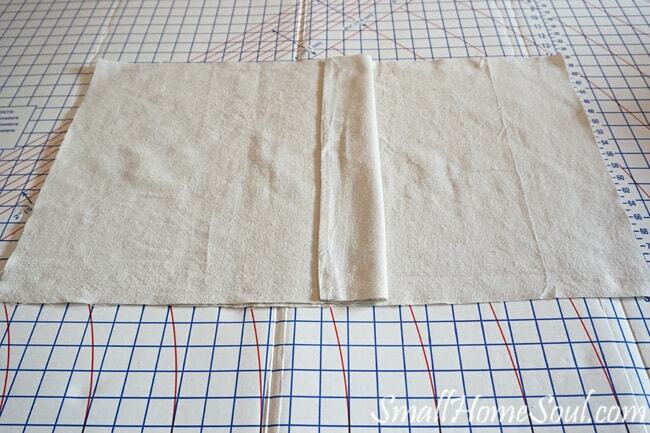 With 1/2″ seams that will give me a nice full pillow. The measurement for the back needs a little more math since I’m making it without a zipper and more like a pillow sham. 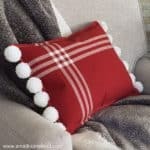 The width of the pillow is 26″ and I need the two halves on the back to overlap by 2″ with a 2″ folded hem where they halves overlap. 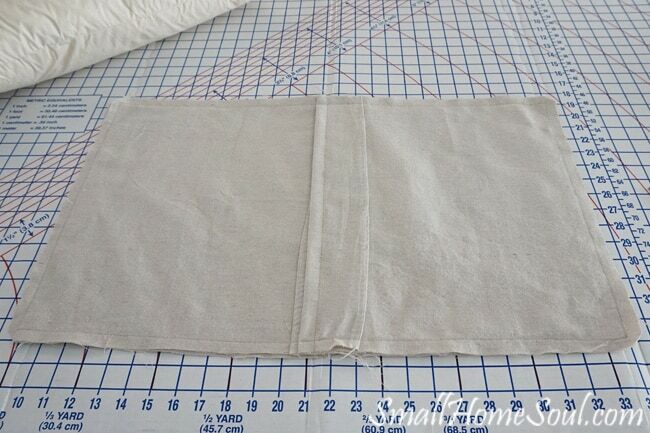 I’ve seen some people use a small hem but since the pillow will be full I want it to have a more substance at that seam so it doesn’t gape in the back once the pillow is inserted. Here’s the math….. half the width is 13″ + 1″ overlap (adding 1″ to each side gives you a 2″ overlap) and a 2″ hem, so each half of the back piece will be 16″ tall by 16″ wide. Now lay the right sides together. Since we’re using a drop cloth and not regular fabric there is no real right side since there is no pattern to worry about. Below is the example of the front on the bottom and one side piece with the folded hem laying on top. Lay the second half in the opposite direction and align the edges. Adjust the folds as needed so they line up. Pin the edges of the pillow. 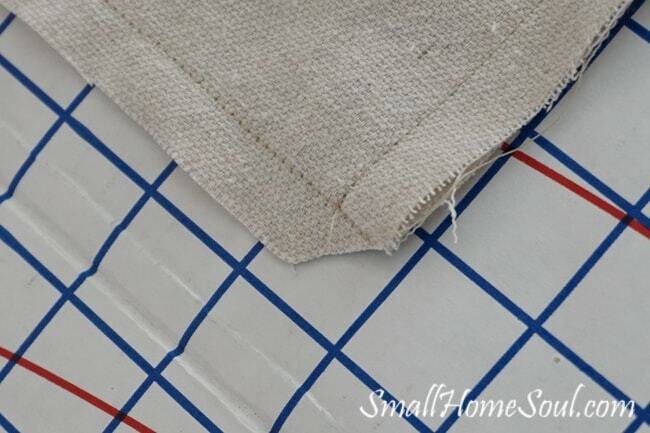 When I cut the two back pieces I used the original stitched edge of the drop cloth for one side so I didn’t have to stitch a hem on the edge of my folded half so it wouldn’t fray. 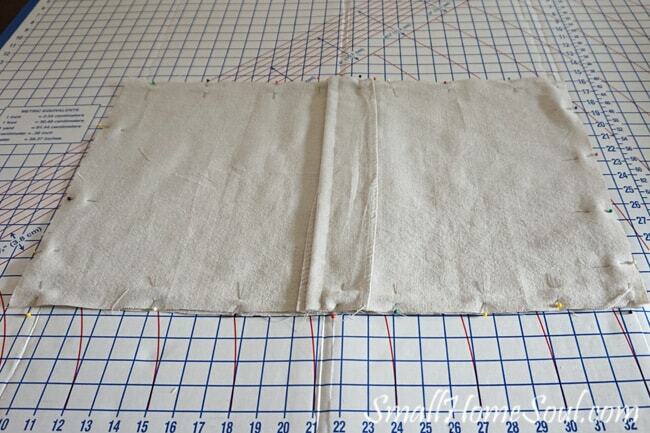 I did stitch 1/2″ from the fold for a more finished look. Then off to the sewing machine to stitch all four sides. All stitched up. The crooked edge you see is from the original drop cloth that was not even. That will be inside the pillow so I wasn’t worried about it. As long as my folds and hems are even I’m happy. 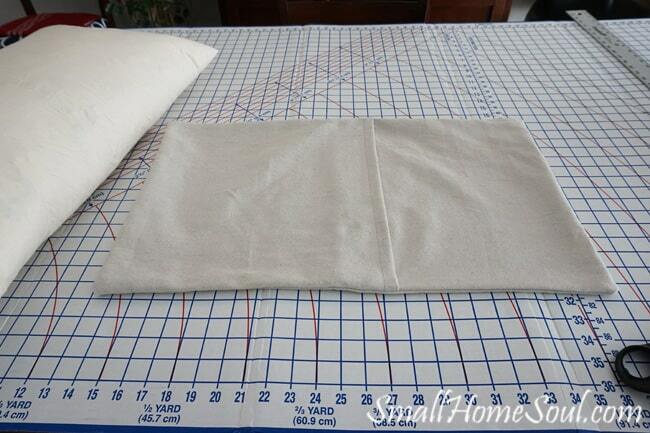 Before you turn the pillow cover right side out snip the corners like the picture below. This will help make your pillow corners sharp. Be sure to read my tips below for more info. Cool, the cover is all done and ready for the pillow. Oh, but now it’s time to add some decoration. I found this stencil at Hobby Lobby for $2.99 and it’s perfect. You can pick any stencil design you like or make your own. I haven’t tried that yet but I have a Cricut I got from a friend that I’ll have to learn how to use one of these days and make my own stencil. I put a plastic cutting board inside so no paint could bleed through. Tape the stencil in place and you’re ready to go. Get some paint on your pouncer and dab a little off onto another paper plate. 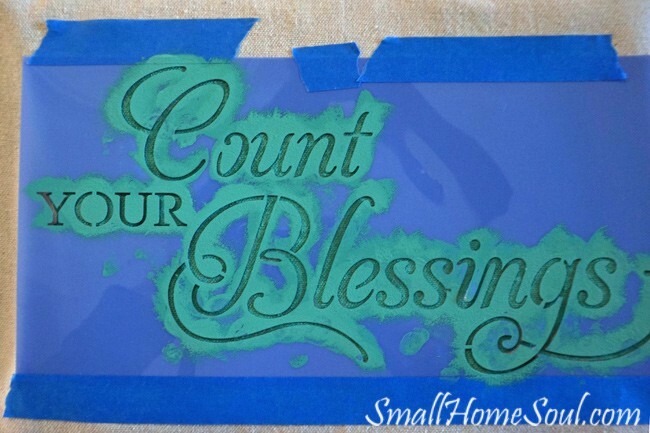 You don’t want too much or it will bleed under the edges of your stencil. Since this had skinny sections I used the side of the pouncer in some areas to make sure I got paint onto the drop cloth in all nooks and crannies of the stencil. This is what it looks like after you’re done. Carefully lift off the stencil. Next I wanted to add a little something extra so I used these cute butterflies from another stencil in white for a nice contrast. Just wait for it to fully dry before you stuff your pillow insert into your new drop cloth pillow cover. I can’t tell you what color I used because I blended it myself. I bought a few blues but they weren’t right so I started mixing them and added some green. The resulting custom color picks up the aqua in the bed pillows. Who would have thought a drop cloth would make a great looking pillow. It adds a some much needed texture to the bedding. When snipping the corners don’t get too close to the stitched corner, it would be a bummer to have to start over. In the future I would stencil onto the front piece before I sewed the pillow cover. There’s no erasing paint from fabric and I had one tiny goof (thankfully only one and I can live with it) that I could have kept from my finished product. 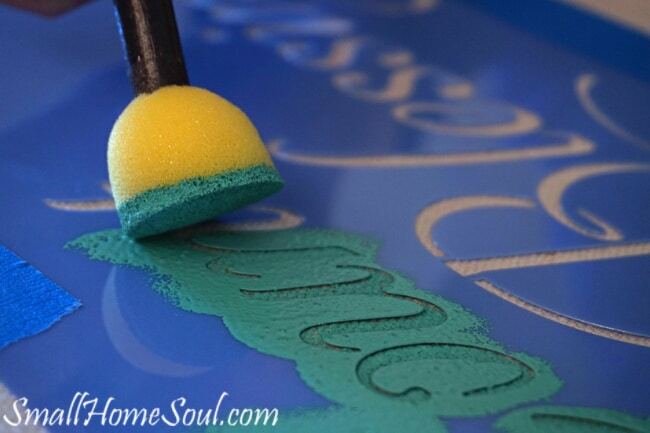 When stenciling lay your fabric on a hard surface, and will help keep your finished product polished. Hold each section of the stencil down with your fingers as you pounce. I had one slip because I wasn’t holding it tight enough. Or you could buy Repositional Adhesive Spray. I think I’ll get some for the next time, I should have listened to my mom! What a great addition to our bedroom. We are truly blessed! 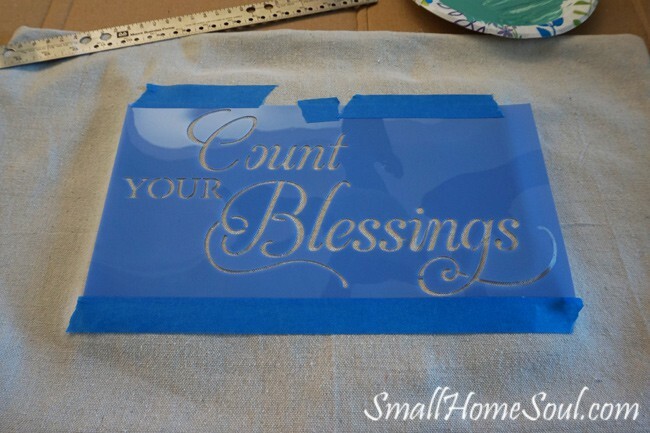 Let me know if you’ve ever used stencils or made a drop cloth pillow cover, or anything else with a drop cloth. There’s so many great ideas out there. And don’t forget to Pin and share this tutorial on social media. Thanks Christy, it was all a last minute thing when my original project hit too many bumps. But I’m thrilled with how it turned out so I think it was meant to be! Wow, I LOVE this dropcloth pillow! You have inspired me to try making this! You did a fabulous job and I love it on your bed! Love it! It looks perfect on your bed right under the picture of you and your husband. Such a fun, cute idea. And I love the color you picked! Hi Heather, thanks for stopping by and your sweet comments! It turned out better than I’d hoped and the color is a nice pop in the room. Thank you Denise, they had a huge selection and it was a hard choice but I thought this one fit perfectly! Thank you Susie, I had a little fumble with the stencil. I knew I should have listened to my mom and bought that adhesive 🙂 oh well, I still love it even with it’s tiny flaw. Toni, this turned out super cute and I love the color you chose for your stencil.